To mark the 400th anniversary of William Shakespeare's death, the Folger Shakespeare Library is sending the first printed collection of all his plays out on tour. 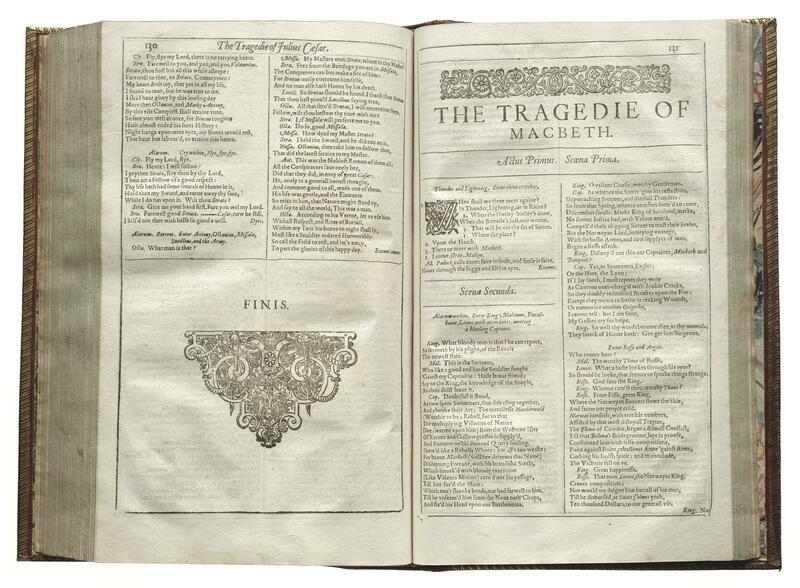 Macbeth is one of the 18 previously unprinted plays that appeared in the First Folio. The Folger has 82 First Folios — the largest collection in the world. It's located several stairways down, in a rare manuscript vault. To reach them, you first have to get through a fire door ... (if a fire did threaten these priceless objects, it would be extinguished not with water — never water near priceless paper — but with a system that removes oxygen from the room). A massive safe door comes next — so heavy it takes two burly guards to open it, and then yet another door, which triggers a bell to alert librarians that someone has entered. After that, there's yet another door and an elevator waaaay down to a vault that nearly spans the length of a city block, says Folger director Michael Witmore. This is where the library stores tens of thousands of pieces of paper — folios, plus half of everything printed in England from 1473 to 1660 and much more. And there, propped open on spongy wedges to protect the binding, is the First Folio. "If you had to pick one book to represent Shakespeare, this is it," Witmore says. Two of Shakespeare's pals put it together in 1623, after he died. John Heminges and Henry Condell were fellow actors who felt the plays should be collected in a single large volume. They also added in 18 of Shakespeare's plays that had never appeared in print, explains Witmore. "Without this book we probably wouldn't have ... Twelfth Night, Julius Caesar, Macbeth, The Winter's Tale ..."
It adds up to a total of 36 plays in the Folio. The others had been printed, as individual works in smaller format (quarto — single pages folded in four, and bound). Some of those were published in Shakespeare's lifetime. Shakespeare didn't spend much of his time coordinating or supervising the printing of his work. He really just wanted to write. He wrote on vellum, with a goose quill pen he cut himself, and ink he may have made. There was a ready audience for Shakespeare's work, which was sold in bookseller shops and stalls in London. For 20 shillings ($200 in today's money) you could buy loose sheets of paper and take them to your binder, who put them between hard covers. 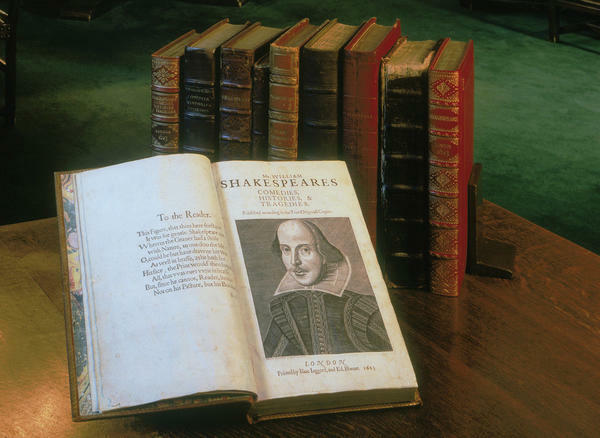 Of the approximately 750 copies of the First Folio that were printed, 233 survive. The book was so popular that more editions were printed and eventually there were four folios. Each time it was printed, someone made changes in the text — which has kept centuries of Shakespeare scholars busy! To scholars and actors, this 4 pound, 13 ounce volume is the paper equivalent of The Holy Grail. "I can't think of another playwright with an output of this magnitude," says Sarah Pretz, a graduate of the D.C. Shakespeare Theatre's Academy of Classical Acting. Shakespeare's works, she believes, changed "the way people think about the world and the way people think about each other." That is exactly why those two Shakespeare friends, the folio-makers, wanted the plays preserved. Thomas Keegan, another graduate of the Shakespeare Theatre Academy, says if the folios hadn't been made all those centuries ago, he probably wouldn't have the opportunity to read and perform these works today. Eighteen of the Folger Shakespeare Library's First Folios will be touring the country — six at a time for a year — to mark the 400th anniversary of the master's death. Let's look now at one of the world's most precious printed volumes. It is the book that gave us Shakespeare. And it's going on tour, beginning today in Norman, Okla. The Folger Shakespeare Library here in Washington, D.C. is sending out the "First Folio" to all 50 states to mark the 400th anniversary of Shakespeare's death. The "First Folio" was published seven years after Shakespeare died. And it's the first printed collection of all of his plays. NPR special correspondent Susan Stamberg went to the library's vault for rare manuscripts before the folio hit the road. SUSAN STAMBERG, BYLINE: I asked two young classical actors to come along. SARAH PRETZ: I'm so excited. I can't wait to go down. I can't wait. THOMAS KEEGAN: Sarah's not containing her excitement very well. PRETZ: I'm not. I'm really not. STAMBERG: Neither could I. They had to wait a bit, though. Folger director Michael Witmore took me first. MICHAEL WITMORE: I just have to grab my vault keys. STAMBERG: The Folger has 82 "First Folios," the most in the world. The books are kept several stairways down in the vault. WITMORE: Here we go, through the fire door. STAMBERG: If, heaven forefend, a fire did threaten these priceless objects, it would be extinguished not with water - never water near priceless paper - but with a system that removes oxygen from the room. A massive safe door comes next. Oh, my goodness. It looks like my bank. So heavy it takes two burly guards to open it, and then another door. STAMBERG: An elevator way down. WITMORE: We're now going to a vault that spans the length of almost a city block. STAMBERG: To where they store tens of thousands of pieces of paper, folios plus half of everything printed in England from 1473 to 1660 and more. And there, propped open on spongy wedges to protect the binding, the "First Folio." WITMORE: If you had to pick one book to represent Shakespeare, this is it. STAMBERG: Two of Shakespeare's pals put it together in 1623 after he died. John Hemmings and Henry Condell were fellow actors who felt the plays should be collected in a single large volume. The men added some literary gold to the project. WITMORE: They put 18 plays that had never appeared in print into the "First Folio." 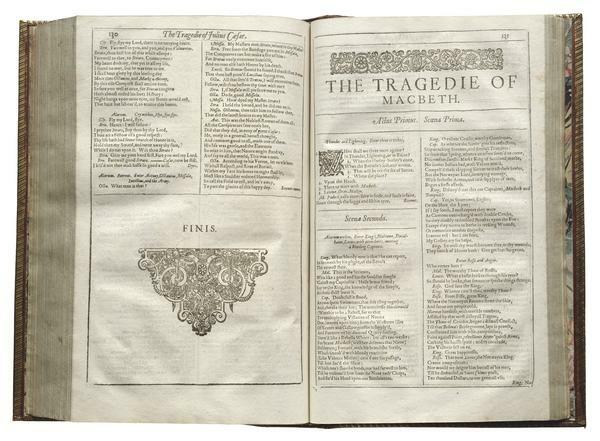 Without this book, we probably wouldn't have 18 of Shakespeare's plays, including "Twelfth Night," "Julius Caesar," "Macbeth," "The Winter's Tale." STAMBERG: So a total of 36 plays in the folio. The others had been printed as individual works in smaller format, quarto, single pages folded in four and bound. Some of those were published in Shakespeare's lifetime. Would he have been able to supervise the publication of those quartos so - to make sure that they were his words, the words as he wanted them put in print? WITMORE: We believe he did not. STAMBERG: He wasn't much interested. He wanted to write - on vellum with a goose-quill pen he cut himself and ink he may have made. There was a ready audience for Shakespeare's writing. WITMORE: You would buy this book outside of St. Paul's. It would have been in a stall in a bookseller's shop. STAMBERG: St. Paul's Cathedral in London. STAMBERG: For 20 shillings, $200 in today's money, you bought loose sheets of paper and took them to your binder, who put them between hard covers. They think 750 copies of the "First Folio" were printed. Just 233 survived. The book was so popular that more editions were printed. Eventually there were four folios. And each time it was printed, someone made changes in the text, which is what has kept armies of Shakespeare scholars busy for centuries. Very carefully, Mike Witmore turns the pages of the "First Folio." WITMORE: You may touch it. WITMORE: All right, but your hands have to be clean. STAMBERG: What do you think? WITMORE: I'm going to say that you are okay. STAMBERG: He tells me to hold the foot-long page about 3 inches from the bottom. WITMORE: And then pull it directly across. STAMBERG: I'm holding my breath. Enter two graduates of the D.C. Shakespeare Theater's Academy of Classical Acting, Thomas Keegan and Sarah Pretz. So turn around and look at that. PRETZ: Oh, my God. Oh, my God. It was right behind me. I didn't even know. Oh, my God. KEEGAN: It's just "Hamlet" in the "First Folio." PRETZ: Oh, my God. I'm going to cry. STAMBERG: To Sarah, to other actors, to scholars, this 4-pound-13-ounce volume is the paper equivalent of the Holy Grail. PRETZ: I can't think of another playwright with an output of this magnitude that has changed so many people in the way that people think about the world and the way that people think about each other and relationships. STAMBERG: Which is why those two Shakespeare friends, the folio makers, wanted the plays preserved. KEEGAN: If they're not put down in print there forever, then we don't get to say them today. STAMBERG: Eighteen of the Folger Shakespeare Library's "First Folios" will be touring the country, six at a time for a year, to mark the 400th anniversary of the master's death. Everywhere it goes, the big book will be open here, 793 pages into the "First Folio." KEEGAN: To sleep perchance to dream - ay, there's the rub. STAMBERG: I'm Susan Stamberg, NPR News, Washington. Transcript provided by NPR, Copyright NPR.